A majority of Chinese people, I feel, look like identical twins. And, if Chinese identical twins are playing against you, in Badminton at Rio 2016 Olympics, I’m sure, it could be a bit unnerving. As I watched Luo Ying and Luo Yu, the twin sisters from China, playing against US team, those were my thoughts. Interestingly, when I thought of researching about this Olympics’ twins, triplets and siblings, I was shocked to discover the number! There are, apparently, 36 sets of siblings participating in Rio 2016 Olympics (according to thisisinsider.com). And it set me thinking on the advantages and disadvantages the siblings have, on their journey to Olympics. Among the advantages, I feel, is the convenience which siblings offer parents. Transporting siblings to their training venues, ensuring they have common training regimens, and feeding them according to common diet plans, would be easy! Even updating them on sports-data would be easy! As you read this, a furious debate is raging across Germany on the twin sisters who held hands and smiled as they crossed the finishing line, of Rio’s Marathon for women. Anna and Lisa Hahner came 81st and 82nd making their sports officials angry and upset. The sports officials say the twins’ performance was more than 21 minutes behind the winning time and 15 minutes short of their personal bests. If the twins had not thought of themselves ‘together’, they could’ve run better! But sisters say it was a "magical moment", and they don’t care about accusations of ‘self-promotion’. After all, they say, they received "zero euros funding" from the German Athletics Association. No one is paying attention, however, to North Korean twin sisters - Kim Hye-song and Kim Hye-gyong - who finished 10th and 11th respectively in the same event. 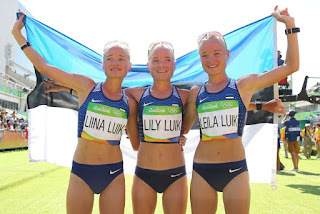 The triplets from Estonia - Leila, Liina and Lily Luik - made Olympics history by participating in the same women's marathon. Sadly, while Lily came 97, and Leila came 114, Liina did not complete the race. Sanne Wevers and her twin sister Lieke competed in gymnastics for the Netherlands. Sanne even beat the hot favorite, USA’s Simone Biles, by winning gold in the balance beam final. Felipe and Daniel Sancery are twins too, on Brazil's men’s rugby team. And so are twin sisters Katherine and Michelle Plouffe on Canada's basketball team. Tennis was represented by two famous siblings, USA's Venus and Serena Williams, and Great Britain’s Jamie and Andy Murray. Unfortunately, the Murrays lost their first match in Rio and failed to advance as a team — but Andy won the gold in men's singles. The Williams sisters were knocked out of the tennis doubles competition in a shocking upset, and from a, probable, fourth Olympic gold. Sadly, both sisters crashed out of singles tournament too, but Venus, won the silver medal in mixed doubles. Age is perhaps catching up. Japan’s table tennis squad had three sisters, Ai Fukuhara, Mima Ito and Kasumi Ishikawa, and even Egypt had Omar and Amro El Geziry, the first brothers to compete in modern pentathlon in the same Olympic Games. If you are twins, triplets and siblings, training in sports, I surmise, you must aim nothing shorts or Olympic medals!